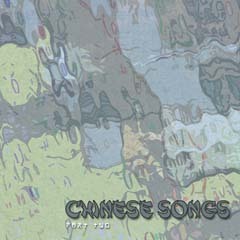 After being a bit disappointed with "Chinese Songs - Part I" I did not lose the hope and went to get this "Chinese Songs - Part II" and. well better than the first part; in fact, better than I supposed it would be. It's not surprising that Part II have much in common with Part I but the approach is more energetic and frantic being responsible to grab immediately the hearer's attention. This album is short, compact and adequately balanced; all those nice instrumentation and singing that forge the band's registered mark are present here and contribute largely to upgrade Part II when compared with Part I (should these Chinese Songs be released as a double album?). All begins with 'Letter to my wife' which reminds some of the most enjoyable of another great LITTLE TRAGEDIES' album ("The Sixth Sense"). The soft and brief 'In the moonlight' provides a kind of intro for the next track, 'My heart is sad, thoughts in dismay. ', which unfortunately does not work, being only repetitive and dull. 'Vernal wind, road dust." increases the album climate, with its catchy and warm tunes. And then comes 'My century events are worthless. ', really the track that makes the difference; it's here that we may see LT at their peak. This song shows clearly all capacities and skills of band's members: splendid keyboards, fine guitars, heavy drumming and great vocals - all acting in accordance to shape the best track of both parts of these Chinese Songs. It's a shame that they close the album with the cold and distant 'The boat by the lake is only for three. ", that perhaps fits well the general concept but musically adds few. Rating "Chinese Songs - Part II" is somewhat challenging because even being one step above the "Chinese Songs - Part I" it did not achieve the full excellence status hence staying in the good, non essential landing which in the end of the day pairs the two albums. Well, it's better to read the reviews (if someone dares to do it).